1.Stock is Retesting its H&S Breakdown Zone 1335-55. thats bearish in nature. 2.In daily chart stock is trading below 200/100EMA. 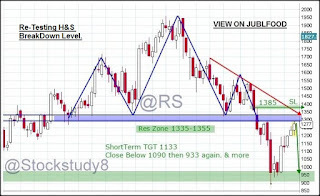 3.One can short near 1335-55 with Sl 1385cb For Shorterm target 1133. 4. Medium-term if stock not able to cross 1385cb then we can again test recent low near 950+/900.